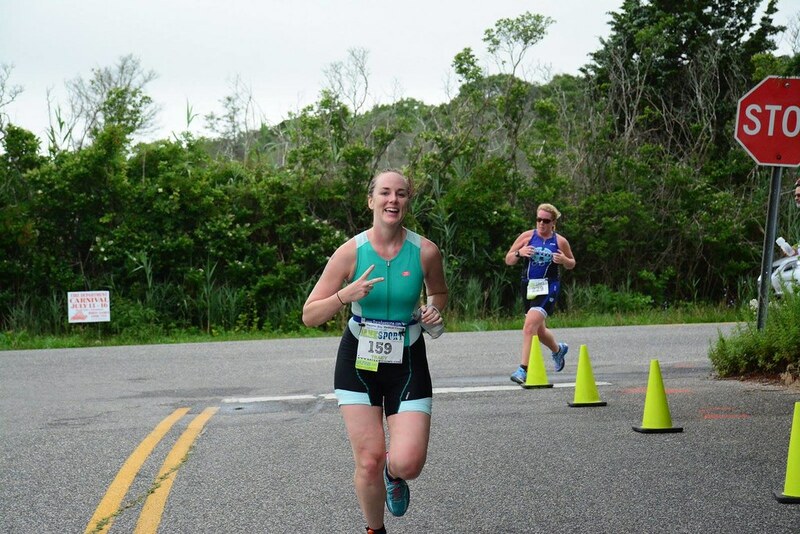 I finished my first (sprint) triathlon on Sunday, July 10th and it was AMAZING. I am still over the moon about the entire experience because it was by far the most fun race I've ever completed. 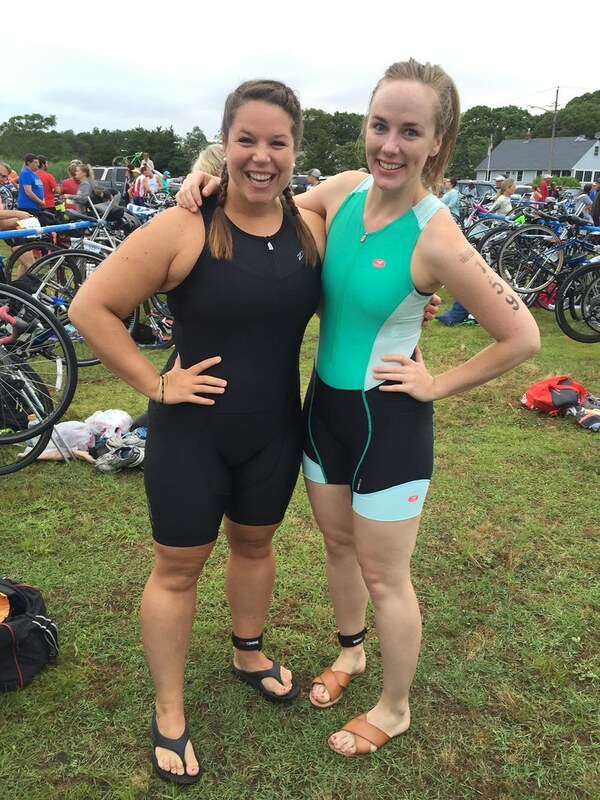 I went out to Jamesport with Emily (who also competed) and Kaitlin who was our cheer squad (and photog!). 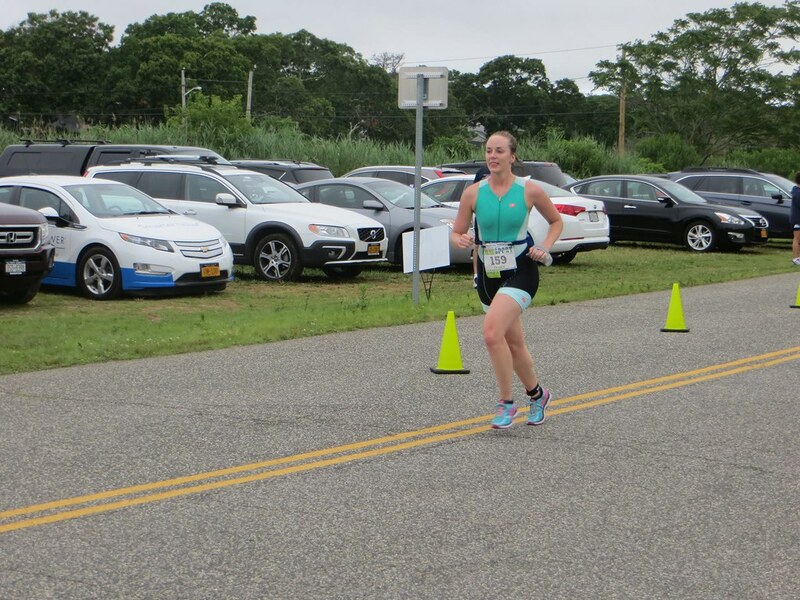 This sprint tri consisted of a 500M swim in the Peconic Bay, a 16.1 mile bike ride around the North Fork and a 5k (3.1 mile) run. Getting our numbers stamped on! At this point we were excited! Then I put my wetsuit on and anxiety set in. 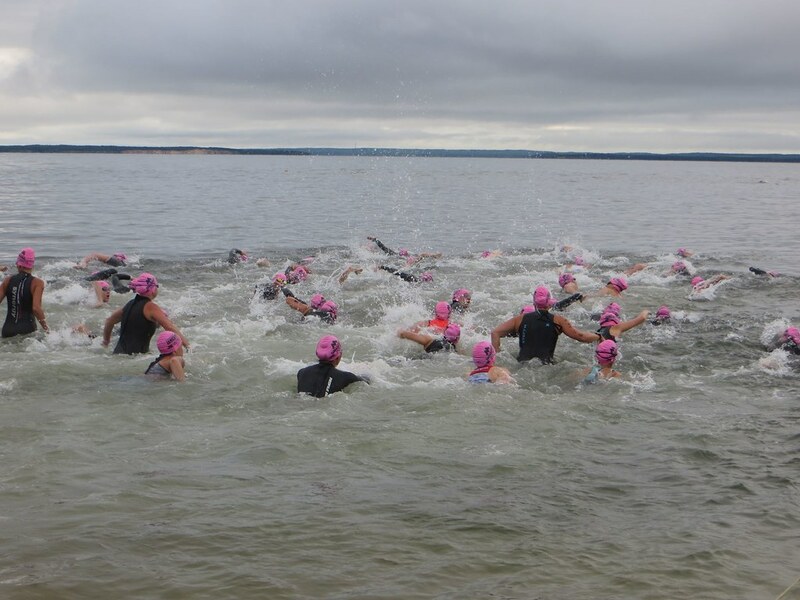 While I definitely didn't train as hard as I could have,I was definitely the least prepared for the swim because I still get a lot of anxiety in the water and I had no idea what to expect with the open water swim. I wore a wetsuit and the water was incredibly warm so luckily I skipped the full body shock people normally experience when running into the water for the first time. What did shock me was that the bay was salt water. I don't ask why this never occurred to me but I guess that's what you get for growing up around lakes and only swimming in pools! 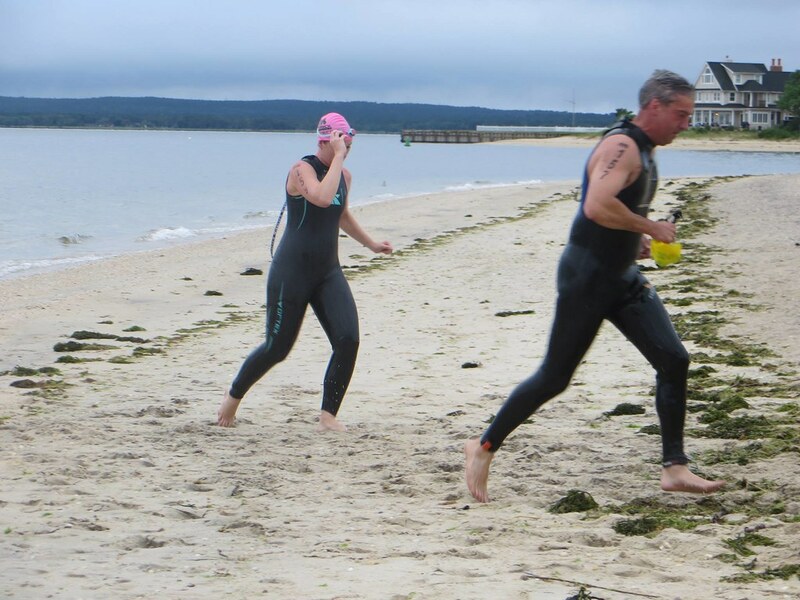 That first splash of salt water to the face was terrible and I ended up back stroking about 90% of the swim. To make sure I was continually sighting, I made up a fun game of flipping over ever 13-15 strokes so I didn't go too far off course. The transition to the bike was not as hard as I expected. It was a bit of a jog to the transition area but luckily I had my whits about me and wasn't too disoriented from the swim. My wetsuit also came off really easily (which was a pleasant surprise). I decided not to clip in to the bike because I hadn't practiced that yet. The bike course was absolutely beautiful. We were passing all the farms and fields and it was so peaceful and I truly think the bike was my favorite part. I was also fascinated by the ages of other participants. You get your age stamped on your right calf so every time someone passed me I would note their age and they ranged all the way from 18 - 75,! 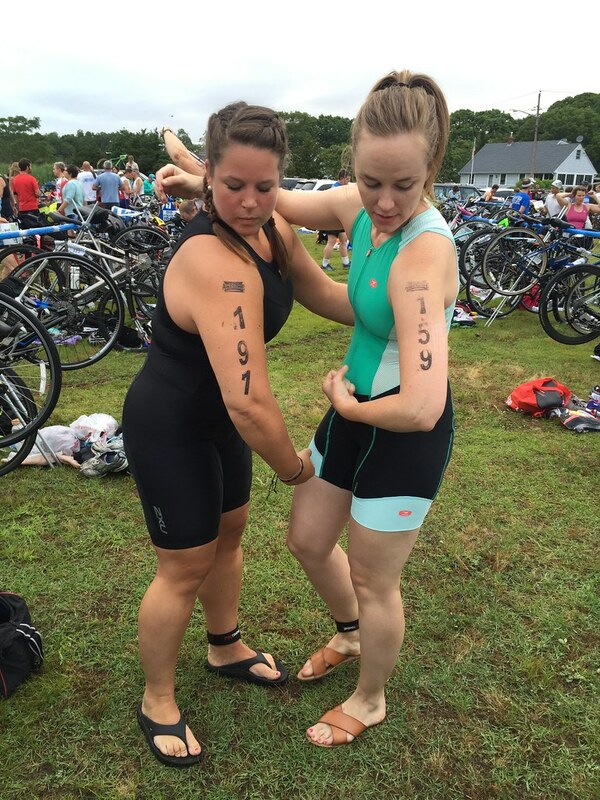 All I could think was that I will make it a new #lifegoal to still be competing in triathlons when I'm in my 70s. It was incredible. The bike to run was totally comical. Since I didn't clip in I literally racked the bike, took my helmet off, clipped on my number belt and took off. My legs felt like lead and I really thought I'd have the WORST time. Knowing I wasn't going for any specific time goal but rather to just finish, I really focused on relaxing and settling into my breathing. I don't think I had really caught my breath between the swim and the bike so it was nice to chill and just jog along. I had estimated the race would take me about 2 hours so when I rounded the corner to the finish and saw the time I was ecstatic! Unofficially I saw my time as 1:47 which was amazing. I later found out my official time was 1:42 which was even better! 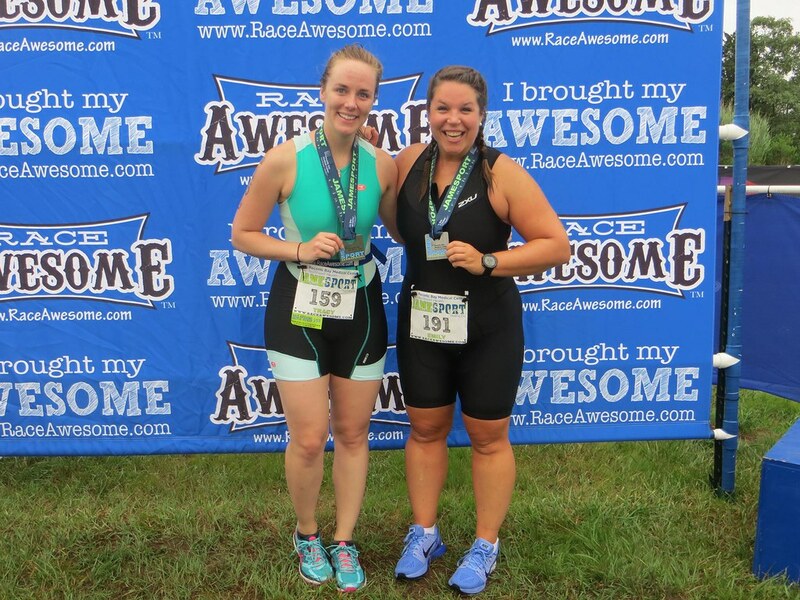 I think this triathlon was so good for me because it pushed me to try something new that I wasn't sure I would succeed at. It's so easy to just get out and run when I've been doing it for so long but by challenging myself to do this race, it reminded me that trying new things is sometimes scary but necessary to continue to grow and develop. I have to give a huge thanks to my friend Peter for all the amazing bike knowledge and showing me the riding ropes, Nina for letting me borrow her wheels and my NP fam for all the well wishes and support. I am beyond pleased with my performance considering I didn't train nearly as hard as I could have. 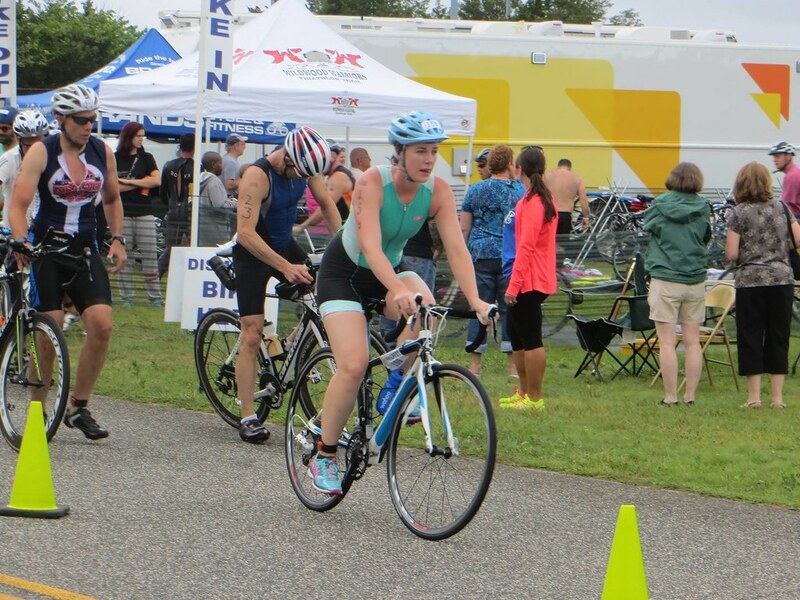 I don't think there will be any more triathlons this summer but I'm gearing up to get my own bike and sign up for at least one if not two next year! 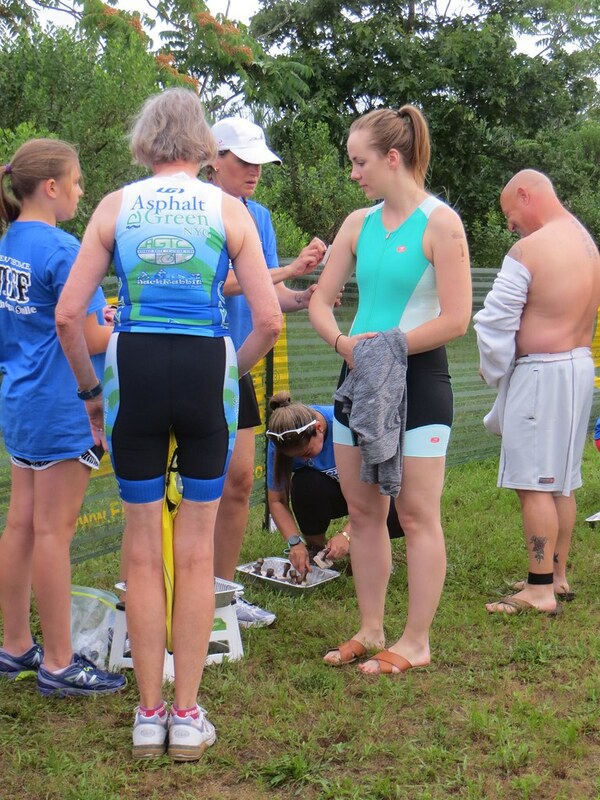 I am definitely planning to do a post talking about my packing strategy, how I set up my transition area, my favorite triathlon resources, etc. so look forward to those! I also started NYC Marathon training this week so keep me in your thoughts as I start to rack up the miles. I'll hopefully get back into regular Fitness Friday posts recapping my runs and workouts so stay tuned for those!